'Immediate' aspirin has been shown to significantly reduce deaths from heart attack, and the earlier it is taken during a heart attack, the greater the benefit. Aspod® is the only system in the world specifically designed to provide you with instant access to an emergency dose of soluble aspirin - wherever you are, 24 hours a day, even in the dark. Aspirin is extremely susceptible to dampness; this will cause it to lose its stability, become less effective, and may smell of vinegar.Aspirin, is particularly prone to break into smaller particles (friability), and is likely to be powdered when needed and therefore difficult to take.The ASPOD® design team and engineers eliminated these problems during the two year design and development stage. The ASPOD® will ensure that, when needed, an emergency dose of 300mg aspirin is easily accessible and in a stable condition. The ASPOD® device was conceived, designed, and manufactured in the United Kingdom. It is slim, light, and little larger than a 50p coin. ASPOD’s unique x2mlock™ design means that aspirin will remain dry and stable for at least six months once placed in the device. 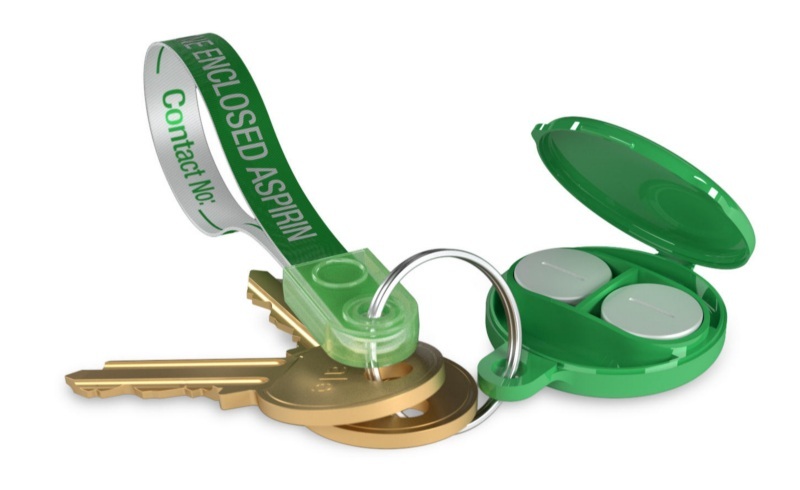 Customers can register their ASPOD® online and will be reminded, via email, to change the aspirin every six months.These exclusive design features, plus the electronic reminder facility, will ensure that the 300mg dose of aspirin is available, and of optimum efficacy if/when needed.The ASPOD® is manufactured in ‘pharmacy green’ and made from robust, scratch resistant polymers and designed to fasten onto, or act as, a key ring. In order to make it easier to add keys onto the ASPDOD® key ring, we have moved from the conventional round key ring to a 'G ring'. This has a leading edge, which protrudes slightly into the centre of the ring, and no pressure is required to open the ring. The ASPOD® can also be hung from a belt loop, handbag, sports bag, or rucksack by using the sturdy metal belt clip supplied. By using custom made (inert) Pharmagraf ™ pads, tablet movement and rattle has been eliminated, tablets will not be tainted, the pads are coloured grey and will not be mistaken for a tablet!The ASPOD® has been designed to have high visibility in order to attract the attention of ‘first aiders’ in cases where the patient may be unable to administer the aspirin themselves. Also provided with the device is an info-loop™. The info-loop™ attaches to the ASPOD®, and because it is luminous it makes the ASPOD® easily accessible, even in the dark. The Info-loop™ also carries critical information outlining the correct procedure to be followed in the case of a suspected heart attack. By using a permanent marker pen the patient’s name, together with an emergency contact telephone number, can be added to the info-loop™. This will provide emergency services with vital information. Our mission is to reduce deaths by informing and empowering the public to carry and take, where appropriate, a 300mg soluble aspirin in the case of a suspected heart attack.